The new plaza at the corner of Franklin and Arch streets, with an adjacent bike lane, viewed from ten floors above. 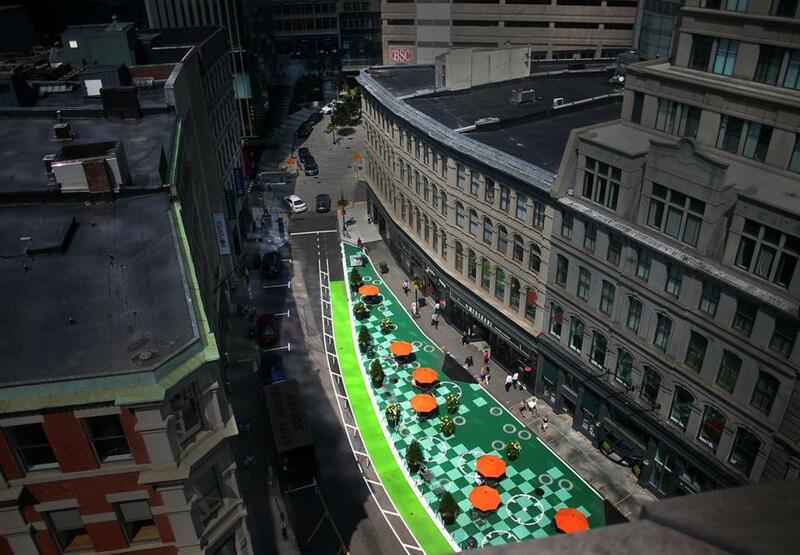 In an effort to transform busy streets into pedestrian-friendly areas, the city celebrated the opening of Tontine Crescent plaza, a seating and gathering space in the heart of downtown Boston. 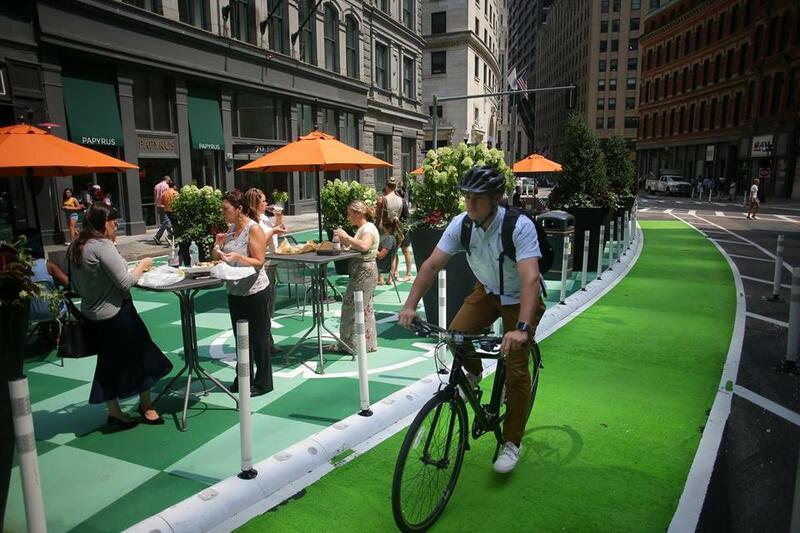 Green paint, outdoor seating with orange umbrellas, and potted plants surrounded by a bike lane delineate this special section of Franklin Street. Community members have already made themselves comfortable in the mini-park. Tom Hanraty could be heard singing the blues at one of the plaza’s tables. “Don’t say I don’t love you, because I never text you back,” he sang. Every day before work, he serenades pedestrians with his harmonica in hopes of booking a gig. Hanraty is one of many locals who can now enjoy bustling city life from a colorful, leafy redoubt right in the middle of the Financial District, a place to chat with coworkers at lunchtime. The Boston Transportation Department redesigned the roadway between Arch and Hawley streets to benefit all modes of travel on Franklin Street, a statement from Mayor Martin J. Walsh’s office said. The plaza’s renovation is part of the city’s “Go Boston 2030”plan, which aims to reclaim surplus roadway space for safer, more enjoyable purposes. “Our streets and sidewalks are not just our paths to and from school or work, they are also our front stoops and our neighborhood gathering spaces,” said Chris Osgood, the mayor’s chief of streets, transportation, and sanitation. 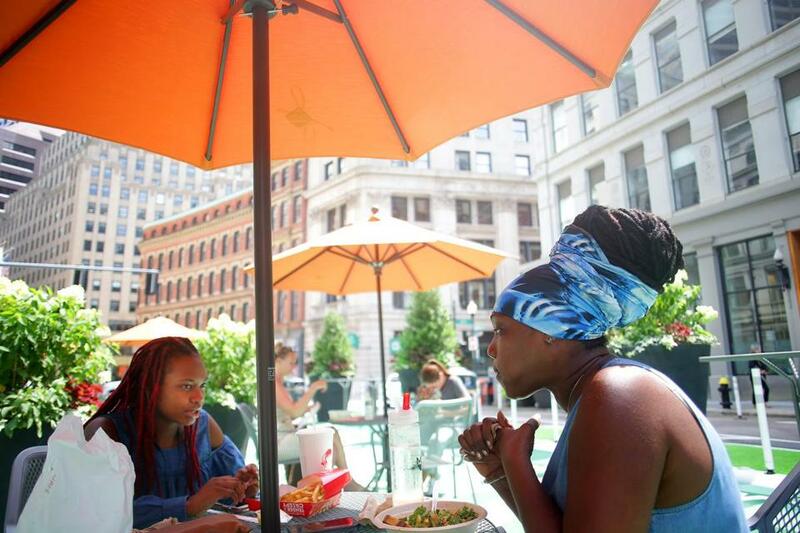 Gail Cummings, right, shared lunch with her daughter Abygail Rudder at a table in the new plaza at the corner of Franklin and Arch streets. The new space reimagines an 18th century Charles Bulfinch-designed urban park that had been converted to roadway space over time to accommodate the many vehicles that pass through downtown every day. The plaza will stay in its temporary form for a few years, the statement said, and the city will evaluate its use and impacts. A cyclist rode in the dedicated bike lane. Katie Camero can be reached at katie.camero@globe.com.